I was wrong. 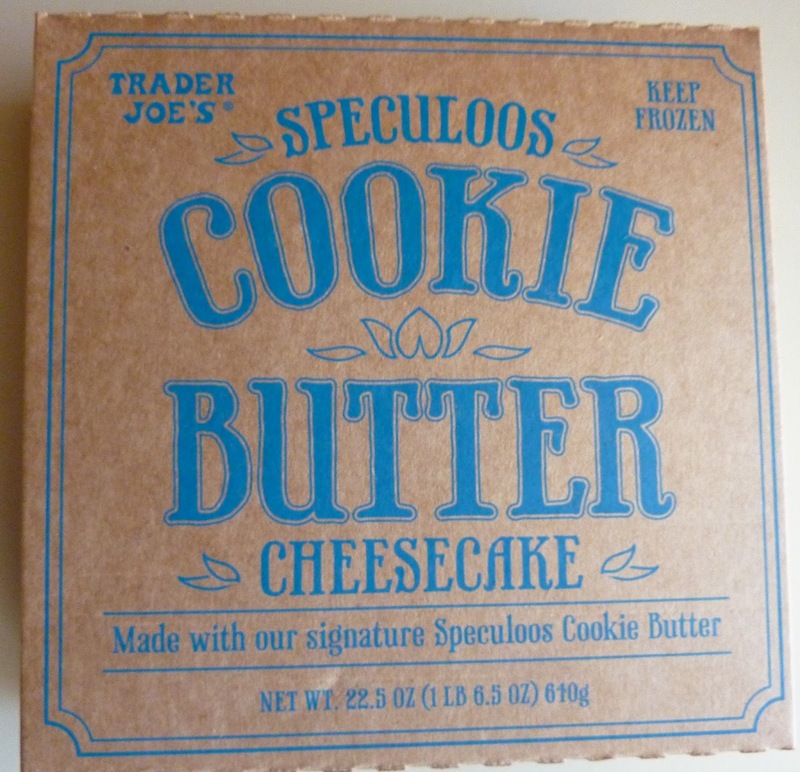 The next fiendish play in Trader Joe's diabolical plan to take over the world/make me fat (or fatter, depending on your perspective) wasn't Cookie Butter and Cocoa Swirl Ice Cream. It was cheesecake. We shoulda seen that comin'. But man. This stuff blindsided me like an 18-wheeler at a complicated New Jersey intersection with "jughandles" and no left turns and such. Except way more awesome than getting T-boned by a semi. WAY more awesome. Apparently, this stuff showed up at the Marlton TJ's just last night, and like half the staff has already tried it. I'm lucky there were any packages left. Really lucky. Because this stuff tastes like heaven. Imagine cookie butter. But cheesecake. I know that's not particularly informative. You've probably already gathered those two bits of information by now. But...it actually tastes like what you want it to taste like. 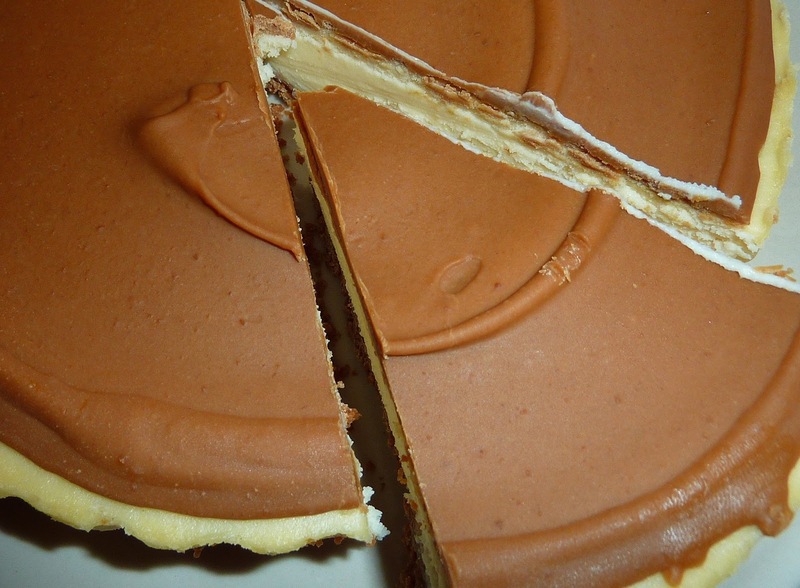 It's basically really amazing plain cheesecake crowned with a cookie butter spread on top. And the crust is made of speculoos cookie material! It's cinnamony, it's creamy, and it's just about perfect. It better be. Because it's seven friggin' dollars a box! But as a once-in-a-while or whenever-TJ's-can-keep-it-in-stock treat, it's worth it. Seriously. I speak the truth. And, well, truth be told, I didn't wait the full two hours for thawage to occur for my first piece. But it was still amazing. Just as amazing as my second piece, which was fully thawed. The only difference was how cold and firm the first piece was. I'm pretty sure I'd be happy eating this stuff straight out of the freezer. Or off the blistering concrete on a hot summer day. I don't mean to sound desperate. It's just...BECAUSE COOKIE BUTTER CHEESECAKE. The only thing I can think of that would be meaner than offering another incredible cookie butter product right now before the holidays would be something along the lines of Trader Joe's getting together with Big Pharma and offering prescriptions for cookie butter I.V. bags. It's been a while since a perfect score, and Sonia and I are both on board this time. This is an incredibly delicious product. Even in light of its price tag and its not-so-much-for-folks-on-diets style nutrition info—this puppy gets a perfect 10. Going to get this in a minute! Thanks a lot! I saw this last night! I was confused because it must be so new that they don't even have a sign for it yet... alas, I am trying to eat healthy, but am planning on bringing this cheesecake to Christmas dinner now! Thanks for trying it for us! Trust me, it was my pleasure. How many pieces do you think you can get out of it? Package says 6. I'd say that's about right. It's very filling. I had 2 small pieces and I probably won't eat anything else today. When I saw this post I said "oh sh*t!" Then I waited until my local TJ's opened and I bought two! One to taste test and one for Thanksgiving! "Oh shoot!" is right, C&A! I love this product. Highly recommend eating a slice of this cheesecake with Gingerbread head beer made by Shipyard. I'll be looking for this for sure...thanks. The cranberry walnut ring looks good. (Frozen; let rise overnight and bake like the croissants) Anyone try this yet? I walked into a North Carolina Trader Joe's right before Thanksgiving, and they were sampling this along with the cranberry walnut tart. They recommended trying the cranberry first (obviously - it would be a letdown if you tried it AFTER this cheesecake). The employee behind the sample counter joked that she wanted to take pictures of people's reactions when they tried it - it is so incredibly good! I didn't buy one this time - I would have eaten the entire thing - but I did have two little sample plates, and I would have taken more if I could have figured out a covert way to do it. I would love to see a wall plastered with pics of people's reactions to this stuff! crap I'm already fat from Thanksgiving (8 pieces of pie Thanksgiving Holiday weekend) but I want to give this a try. If I were starving and this was all there was to eat, I don't think I could get myself to even take a bite. Enjoy. I bought this in the new item freezer about three weeks ago for a party and or family Xmas eve. It is now Christmas evening and I am alone and tired of it all. Then I remember! I have it in the back of the fridge thawed, but forgot to put it out. I even have a can of TJ's whipped cream. I enjoyed my first slice reading your review. I had images of Vercua Salt describing the different flavors as she reported on her savory slice. That's a great idea...they really need to do a Charlie and the Cookie Butter Factory movie! OMG! I cannot believe this exists. The cookie cocoa butter is my crack, and that ice cream they make is heavenly! If I come across this at my local TJ's here in Massachusetts I will have no choice but to get it! It's pretty amazing. I hope you find some up there in Mass! They have cookie butter cheesecake bites as of March 2015 in my local store. but it's more swirled/marble like as opposed to the bigger version.